As 2009 begins we present below the club premiers and provincial champions from across the world of Australian football for 2008. This is the third year in a row that we've compiled the list (see Club Premiers 2006 and Club Premiers 2007). It was a year in which we saw many multiple-in-a-row premierships for some but notably not red-hot favourites Geelong in the AFL. One tier down, at Australian state league level, former strugglers Central Districts made it a remarkable 7 out of the last 9 in the SANFL in South Australia. But that still doesn't match the 8 in a row by the Shepherds Bush Raiders in London's Conference. The same club is also home to the West London Wildcats (pictured) who racked up their 5th straight London Premiership title, while the club's third side, the Ealing Emus, also claimed the Social League, leaving no doubt that the West London club is the most dominant outside of Australia - and can any within Australia lay claim to such success? The Goodwood Saints won their fourth straight in the SAAFL (South Australian amateurs), Subiaco 3-peated in Western Australia's top league as did Launceston in the Northern Tasmanian league and the Eastern Blues in New Zealand's South Island Canterbury league. Teams going back-to-back included Glenorchy in Tasmania's Southern Football League, the Darebin Falcons in the Victorian Women's Premier Division and Solna in Sweden's Stockholm league. As usual we include the disclaimer that in a place like Australia there are dozens of leagues of good standard, so here we've limited ourselves to the national competition and the major leagues in each state and territory. In other countries there are sometimes smaller city-based leagues, such as metro competitions in many US cities. Again, we've limited ourselves to the major interstate championships. Results are for men's senior competition grand finals unless otherwise stated. Note that the majority of leagues around the world play through the middle of the calendar year (centred on winter in the southern hemisphere, summer in the northern hemisphere), but in a few cases such as Australia's Northern Territory and parts of New Zealand, matches are played spanning two calendar years (the end of one and the start of the next). In these cases the season completed earlier in the year is listed here. Thanks to the officials and volunteers who helped us compile this list. Let us know if there are any major league results we've missed. AFL - Hawthorn 18.7 (115) to Geelong 11.23 (89). Crowd 100,012 at the Melbourne Cricket Ground, Melbourne. South Australia - SANFL - Central Districts 17.13 (111) def Glenelg 10.11 (71). Crowd 34,128 at AAMI Stadium, Adelaide. South Australia - SAAFL - Goodwood Saints 13.9 (87) def Salisbury North 9.4 (58) at Thebarton Oval. South Australia - SA Women's FL - Eagles versus Greenacres (result unknown) at Flinders Park Football Oval, Adelaide. Victoria - VFL - North Ballarat 18.12 (120) def Port Melbourne 11.9 (75). Crowd 11,641 at Telstra Dome, Melbourne. Victoria - Victorian Women's FL (Division 1) - Darebin Falcons 15.10 (100) def Melbourne University 4.8 (32) at Trevor Barker Oval, Sandringham. Victoria - VAFA (A Section) - St Bede’s/Mentone Tigers 10.17 (77) def Collegians 5.7 (47) at Sportscover Arena in Elsternwick, Melbourne. Western Australia - WAFL - Subiaco 22.16 (148) def Swan Districts 14.7 (91). Crowd 23,199 at Subiaco Oval, Perth. Western Australia - WA Women's FL - Coastal Titans 7.6 (48) def Swan Districts 3.2 (20) at Subiaco Oval, Perth. Queensland - AFLQ State League - Southport 18.7 (115) def Morningside 15.17 (107). Crowd approx 2,000 at Carrara Stadium, Gold Coast. Tasmania - North Tasmanian FL - Launceston 17.18 (120) def Burnie 14.20 (107). Tasmania - Southern FL - Premier League - Glenorchy 21.17 (143) def North Hobart 12.17 (89). Tasmania - Southern FL - Regional League - Huonville 16.9 (105) def Lindisfarne 9.14 (68). Crowd 4397. NSW/ACT - Sydney AFL - Pennant Hills 20.12 (132) def East Coast Eagles 3.10 (28) at Henson Park, Marrickville, Sydney. NSW - Sydney Women's AFL - Western Wolves 2.1 (13) def Balmain Dockers 1.5 (11) at Mahoney Park. ACT - Canberra Women's AFL - Eastlake 6.5 (41) def Ainslie 2.4 (16) at Ainslie Football Park. AFL Canberra - Sydney Swans Reserves 11.4 (70) def Belconnen 9.15 (69), at Manuka Oval, Canberra. Northern Territory - NTAFL (2007/08 season) - St Marys 21.20 (146) def Waratahs 7.8 (50) at TIO (Marrara) Stadium, Darwin. Auckland AFL - North Shore Tigers 15.15 (105) def University Blues 13.2 (80). Wellington AFL - Eastern Suburbs Bulldogs 12.12 (84) def North City Demons 5.4 (34). Canterbury AFL - Eastern Blues 11.18 (84) def University Cougars 4.4 (28). Waikato AFL - not available. 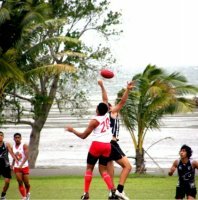 Port Moresby Kelloggs Mars AFL premiership - Pro-Mak University Bulldogs 11.7 (73) def Moresby Swans 8.9 (57) in Port Moresby. Unable to obtain results from other PNG leagues at time of writing. Japan AFL - Tokyo Goannas 26.11 (167) d Eastern Hawks 9.11 (65). Ontario AFL - Etobicoke Kangaroos 7.12 (54) def Toronto Eagles 8.5 (53) at Humber College Park. Runge Metro Cup (Calgary Women's League) - Calgary Nighthawks 5.0 (30) def Calgary Kingfishers 1.7 (13) at Queen Elizabeth School, Calgary. North West Pacific AFL - Vancouver Cougars 11.14 (80) def West Coast Saints 4.1 (25). US Nationals - Division 1 - Vancouver Cougars 4.4 (28) def Baltimore/Washington 2.0 (12). US Nationals - Division 2 – Seattle 3.4 (22) def Calgary 0.3 (3). US Nationals - Division 3 – Kansas City 3.8 (26) def St Louis/Austin 1.2 (8). MAAFL - Chicago United (no grand final - finished atop ladder). EAFL - Baltimore Washington Eagles (no grand final - finished atop ladder). AFLG - Rheinland 9.12 (66) def Munich 9.7 (61) in München. Coupe de France - Paris Cockerels 8.9 (57) def Strasbourg 4.4 (28) at Stade Polygône, Bois de Vincennes, Paris. LFAC - Cornellà Bocs finished top (no finals). DAFL - North Copenhagen 10.10 (70) def Farum 9.9 (63) at Stefan. Skåne Local League - GV 13.20 (98) def Helsingborg West 4.10 (34) at Limhamn. Stockholm AFF - Solna 13.11 (89) def Södermalm 12.11 (83) at Årsta Fältet. AFL Sweden West - Karlstad finished top (no finals). AFL London Premiership - West London Wildcats 13.8 (86) def Putney Magpies 4.3 (27) at Clapham Common. AFL London Conference - Shepherds Bush Raiders 7.12 (54) def Clapham Demons 6.11 (47) at Clapham Common. AFL London Social League - Ealing Emus 18.17 (125) def Nottingham Scorpions 1.5 (11) at Clapham Common. Scottish ARFL - No premiership this year (low player numbers and ground availability). ARUK Southern - Southampton Titans 21.14 (140) def Sussex Swans 13.10 (88). ARUK Northern - Newcastle Centurions 11.15 (81) def Middlesbrough Hawks 4.13 (37) at Novocastrians Rugby Club, Newcastle. Wales AFL - Cardiff Double Blues 18.18 (126) def South Cardiff Panthers 2.20 (32) at St Peters Sports and Leisure in Cardiff. Dublin Demons 14.17 (101) def Leeside Lions 9.3 (57) at Castlebar, County Mayo. Helsinki Heatseekers finished top (no finals). National Championships - North West 9.11 (65) def Western Cape 4.9 (33). Western Cape footyWILD Extreme Season 1 - Khayelitsha Divines 4.6 (30) def Nyanga Thunderstorm 4.5 (29).